This is the first known set of still images to capture motion. It was an experiment using 12 cameras positioned around a racetrack by landscape photographer Eadweard Muybridge, who was hired for the project by Leland Stanford, the railroad owner and founder of Stanford University in California. Why did Leland Stanford ask Muybridge to conduct this experiment? He wanted to have evidence of whether a horse in its gallop ever lifted all four hooves in the air at once. The answer - check it out in the frames above! 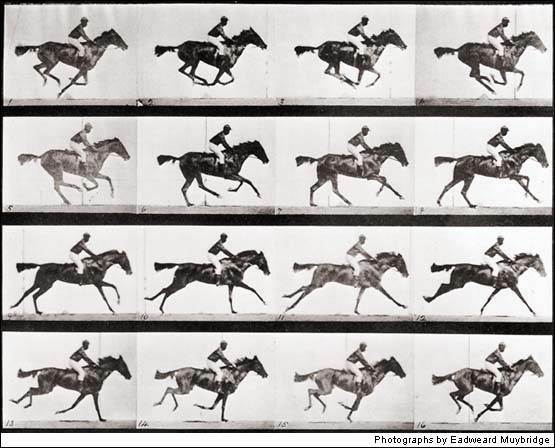 Muybridge, Eadweard., Galloping Horse, 1878. © LIFE.com Accessed 8 July 2010.